A series where I would assume Marvel had permission to do whatever they wanted story-wise, it has the dubious honor of introducing Jaxxon (chronologically the first widely hated Star Wars character) and the alleged inspiration for Cable. It also gave OG fans a taste of an expansive universe, at a time when it was not a guaranteed thing. A couple of Boba Fett covers that people like seem to be the highlight of the series, but personally it's issue #38 that does it for me, with the amazing Michael Golden on art. 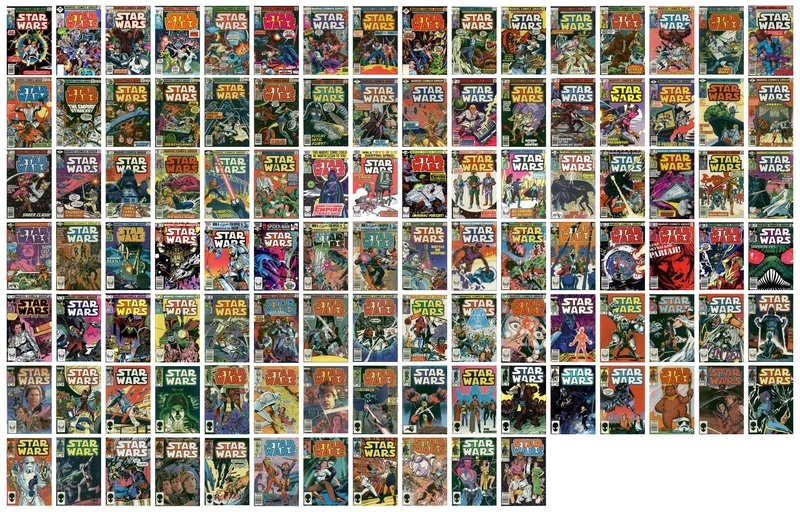 Dark Horse had the rights to publish Star Wars from 1991 to 2014, but they only published a series titled Star Wars after the announcement that Disney had bought Lucasfilm. Even though most of the series they published were supposed to be part of the canon, a new film trilogy meant a reboot of sorts in post Return of the Jedi history. Although I am not the biggest Star Wars fan, there are some comics that I really like from this run, like both Tag & Bink minis, some issues of Star Wars Tales (Garth Ennis doing Star Wars still sounds kinda weird and my absolutely favourite Star Wars comic will probably always be Star Wars Tales #20), the Jabba the Hutt one-shots written by Jim Woodring, … A lot of really fun comics, but ultimately it all seemed a bit complex and the comics featured lots of unrecognizable (to me and the average reader, I would say) characters. So when the 2013 series was announced, writen by Brian Wood and illustrated by Carlos D'Anda (I love this guy's art), I went for it, as it promised to fill in the gaps between the original movies. It started really well, and it would have been fun to see where this was going … but the House of M had plans for it, and it involved hundreds of variant covers!!! So, Star Wars comes back home and it's hard to imagine a better creative team (Jason Aaron and John Cassaday or Stuart Immonen). The series is so far a success, not to mention a recent record-breaking print run on #1. 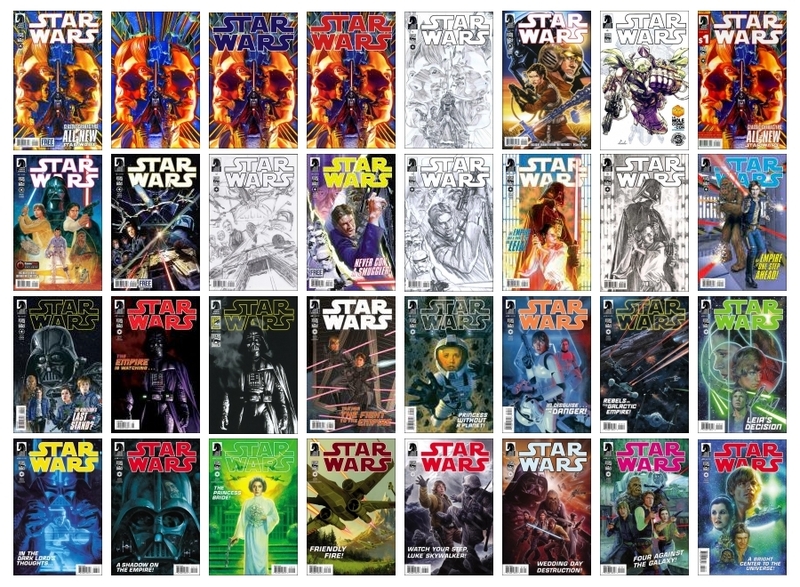 By the end of the week we will see how in canon these comics are, but in any case, it's clear Marvel are putting out the best Star Wars comics they can, and hopefully some of the people going to the cinema will pick these up and get hooked on comics. 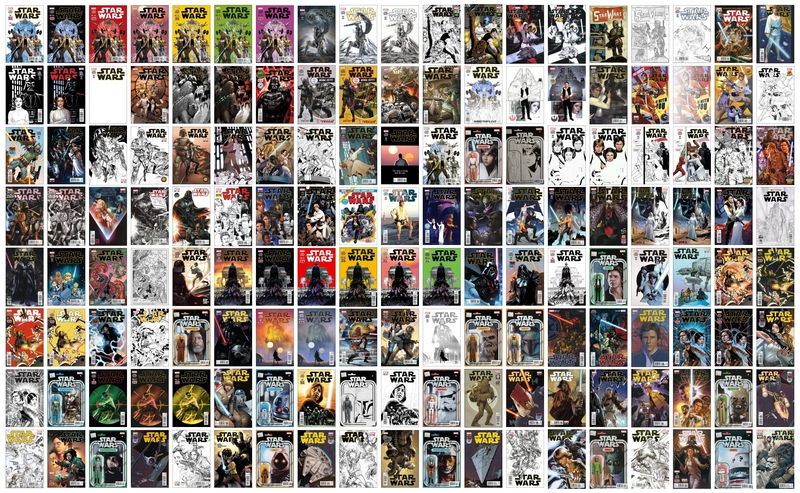 This can get really confusing (there are already 152 covers and the series has just made it to issue #13), so here's a list of the covers to try to make things easier. Star Wars 1 premiere variant? And the password requirements for this site are nuts. This is not NASA or the Federal reserve! Oops never mind- spotted it- Thanks for the list! Wonders what the price guide for Star Wars 1 35 cent variant (rare) 1977 worth? I have CGC grade 7.5 as well. Is star wars # 1 35 cent variant very hot comic today? i see eBay selling it from $ 3,500 to $ 13,500 price range! There are also 7+ exclusive international covers for issue #1 you are missing.